This summer, Infiniti will reveal the future of computer-controlled driving. While it may not be a precursor to autonomous driving - where the car does all of the driving for you - it will usher in an age of better computer-assisted driving. 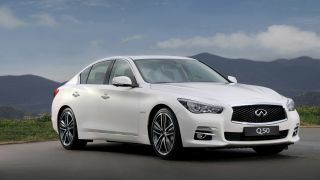 The 2014 Infiniti Q50 is a luxury sedan/saloon car with a sleek, curvy design that will hit dealers in Europe and America this summer. Bert Brooks, North American regional product manager for the company, told TechRadar about two new features that will provide a fine level of control where the driver can feel the road. The car adapts to driving conditions, lane markers and road surfaces 'unlike any vehicle before it'. The first brand new technology in the Infiniti Q50 is called Direct Adaptive Steering, which involves sensors in the car constantly monitoring the position of the steering wheel. A second technology, called Active Lane Control, nudges you slightly back into a lane based on camera readings and sensors. "The steering system, fundamentally, has a goal to provide a wide range of steering responses beyond a conventional steering system," says Brooks. "It uses an electronic feedback loop between the wheel and steering rack." Electronic control means the car feels more responsive, but the Infiniti Q50 will not let you take your hands off the wheel. The key feature is the interaction between the tyres and the steering. The car senses the road and moves you back into the lane gradually. Previous Infiniti models, and many Mercedes and BMW vehicles, nudged you back into your lane. "When the system starts up and everything checks out OK, an electric clutch, which is in the intermediate shaft between the the steering wheel and the steering rack, disengages. At that point you are in the by wire mode. As the driver's hands move the steering wheel, the sensor reads whatever angle they're commanding and then a control unit calculates the required control movement for the tyres. "A set of actuators on the steering rack then move the tyres to that angle. As that happens, the current draw by those actuating motors is measured and calibrated to account for different road surfaces and driving conditions," he says. After all this it provides a force feedback to the driver's hands. Brooks says: "Because this is done many times over and over again you have a continuous closed loop feedback system. The interaction between the car and the road service goes back to the driver's hands." One critical point is that there is a mechanical back-up system that can kick in if the digital steering fails, but the system does replace what's been used in most cars for decades. "On a smooth pavement, the current draw to the motors is low," says Brooks. There's not the same level of force feedback and the steering effort is reduced. If there is a slip on a gravel road or on snow-packed highways, the motors are actuated to a greater sensitivity. "We can filter this and augment as needed. High frequency feedbacks can be filtered out, low frequency inputs that give you a sense of more control can be enhanced," says Brooks. It's an interesting balance, and one that he says is not necessarily preparation to the future of autonomous driving. The goal is to give the driver more control, not less. The steering system is like a force feedback controller in a videogame, where precise control means precise feedback. That said, while the two new technologies are designed for control (and, to the same degree, to enhance safety on the road), the computer aids will help push autonomous driving forward. Previous lane-keeping systems had to use the brakes to nudge you back into a lane, which was a jarring sensation. In future cars, computerised steering could conceivably give you a chance to rest during a long drive and keep you in the lane, hands-free. Next up after that: lower speed autonomous control, and the ultimate nirvana: sending your car out on its own to run errands for you and pick up the kids.